DAY 1: Water fresh trees daily. It's time to trim that Christmas tree, and if you're using a real tree, buy a fresh tree and keep the base of the trunk in water at all times. Keep your tree away from any ignition source such as the fireplace, heaters or candles. DAY 2: Check all sets of lights before decorating. Before you put those lights on the tree or around the front window check the cords closely. Discard any sets that are frayed or damaged. DAY 3: Make sure you have working smoke alarms. Remember, they wear out, so replace them every 10 years. With family and friends spending extra time at your home over the holidays, you'll want everyone to be safe. It's the law to have one working smoke alarm on every storey of your home and outside all sleeping areas. DAY 4: Make sure you have working carbon monoxide alarms. Remember, they wear out, so replace them every 7-10 years depending on the manufacturer. Carbon monoxide is an invisible, odourless gas that can quickly kill you. Installing CSA-approved carbon monoxide alarms in your home. DAY 5: Make sure everyone knows how to get out safely if a fire occurs. Develop and practise a home fire escape plan with all members of the household and make sure someone helps young children, older adults or anyone else that may need assistance to evacuate. Once outside, stay outside and call 911 from a cell phone or neighbours house. DAY 6: Use extension cords wisely. People often use extension cords for that extra set of lights or the dancing Santa in the corner. Extension cords should be used only as a temporary connection. Make sure cords never go under rugs as this can cause damage to the cord and cause a fire. DAY 7: Give space heaters space. If you are using space heaters to help take the chill off, remember to keep them at least one metre (3 feet) away from anything that can burn such as curtains, upholstery, or holiday decorations. DAY 8: When you go out, blow out! Candles can set the perfect mood for a holiday celebration, but remember to always blow out candles before leaving the room or going to bed. 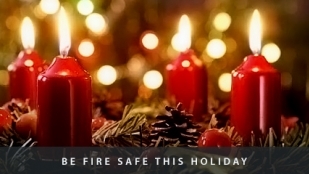 Keep lit candles safely away from children and pets and anything that can burn, such as curtains, upholstery, or holiday decorations. DAY 9: Keep matches and lighters out of the sight and reach of children. People often keep matches and lighters handy to light holiday candles. But matches and lighters can be deadly in the hands of children. If you smoke, have only one lighter or book of matches and keep them with you at all times. DAY 10: Watch what you heat! The holiday season is one of the busiest times of the year, which means it's easy to get distracted from what we are doing. Cooking fires most commonly occur when cooking is left unattended. Always stay in the kitchen when cooking - especially if using oil or high temperatures. If a pot catches fire, carefully slide a tight-fitting lid over the pot to smother the flames and then turn off the heat. DAY 11: Encourage smokers to smoke outside. Careless smoking is the leading cause of fatal fires. If you do allow smoking indoors use large, deep ashtrays that can't be knocked over and make sure cigarette butts are properly extinguished. DAY 12: There's more to responsible drinking than taking a cab home. With all the festive cheer this time of year, keep a close eye on anyone attempting to cook or smoke while under the influence of alcohol. Alcohol is all too often a common factor in many fatal fires.